Mary enlists Toby Cameron, P.I., to initate meddling waaaaay too late. Estelle's lethario reveals a fake last name that's sure to affirm her trust and love. Mary confuses George Clooney for Saul Lewman. Toby reveals her expertise at Internet stalking. "Toby, Meddler-In-Training, Fires Up AOL.com Under Cover Of Super Secret Darkness". A big thanks to @Doug for his thoughtful post about reading comic strips, especially MW, in a print newspaper. Doug, your story of sharing with your father about MW (Wilbur and Fabiana no less!) made me smile and tugged at my heart simultaneously. And three big cheers and hearty thanks to Wanders, who provides this forum for all of us to connect in so many ways! Wanders, your post and the music video had me laughing out loud. @Nance, you've done it again with your BFH title! George Clooney??! Mary, when was the last time you had a thorough eye exam? You better schedule one stat - uou may not dodge a bullet this time. "Arthur Z. 's" fake photo made him look like a Ken doll's toothy grandfather. "Zerro"? Is that pronounced "zero" or "zairo"? If it's the former, I bet KM tee-heed herself silly about making such a clever, oops, lame witticism. Arther Zerro. Of course. Because Arther Stummblebumm might have been too obvious. Does George Clooney sell salad dressing? Maybe I’m confused. Thank you KitKat. and also wanders. It is kinda like family here. I have been around awhile, but haven’t been posting comments of late. I had a profile with the name Toots McGee. It still exists but after the Blogger Google merger, the Doug profile seems to head the Toots profile off at the pass when I visit Mary Worth and Me. Hey, I saw the Fixx when they were the opening act for the Moody Blues. That musta been 1987 or something. 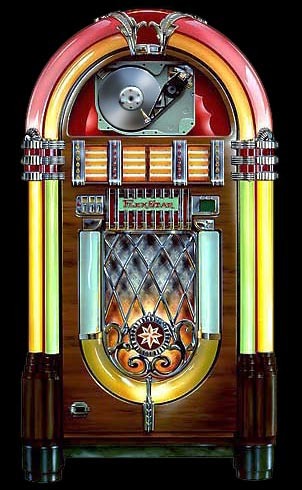 Seems kinda uptempo for the jukebox. No. No, you are not. "Ensign Terry Bryson here from the Enterprise, ready to assist. Estelle did what?" That’s what scammers do, take their neighbours’ names and photos and use them to make profiles for their scams! Arther Zerro is going to be Danny De Vito’s neighbour, right? Sunday: Why does Mary keep msaying that Arther Zerro Zerro Zerro Minus One (that was the name of the little person who was the Martian on an episode of Superman) looks like George Clooney? He looks like George Clooney like I look like Marilyn Monroe. What are KM and JB drinking? Have they ever seen George Clooney or did they just pull the first name that popped up. I'm on pins and needles to see what detective Toby finds out. The best will be when they tell dopey Estelle and she still won't believe it. BTW when you click on "buy print" in Seattle Pi's comic page you don't get the full panel anymore. (I click on it to see the throwaway panel and the out of this wold quote that KM pulls out of her Big Book of Quotes.") Not sure what's going on there. Mary means the George Clooney who sat behind her in third grade and dunked her pigtails in the inkwell. Toby will find out Arther’s picture is from the Sansabelt section of the 1981 Sears catalog, and Estelle will be impressed that he holds down a modeling gig in addition to his lucrative Malaysian construction job. Why does Mary (several times yet) comment that “Arthur’s” picture looks like George Clooney. Is there another George Clooney out there I’m not familiar with? I’m just about positive the fabulous Rosemary Clooney, were she to see Arthur’s picture, would absolutely disagree. And even if there was a strange resemblance, that had nothing to do with uncovering who the guy in the photo really is. Work the problem, Mary.